This ancient dog breed of dog is commonly considered to be the ancestor (in rivalry with the Alaunt, the dog of the Alans) of today's Mastiff-type dogs and of many other modern breeds. Mastiff-type dogs are often referred to as Molossus dogs or Molossers. It is one of the best-known breeds of Greco-Roman antiquity; however, its physical characteristics and function are debated. Though the Molossus breed no longer exists in its original form, this large ancient breed was, along with the Tibetan Mastiff, an important ancestor of modern breeds such as the English Mastiff, St. Bernard, Great Pyrenees, Rottweiler, Great Dane, Newfoundland, Greater Swiss Mountain Dog, and Bernese Mountain Dog. Most scholars agree that the Molossus originated with the Molossis people in the mountainous regions of north west Ancient Greece and southern Albania. The Molossians were renowned for their vicious hounds, which were used by Molossian shepherds of Epirus in the mountains of northwestern Greece to guard their flocks. The poet Grattius, a contemporary of Ovid, writes "...when serious work has come, when bravery must be shown, and the impetuous War-god calls in the utmost hazard, then you could not but admire the renowned Molossians so much." The Molossian dog was traditionally a dog who guarded livestock. In addition, the Epirus region was highly depended on farming. Historical documents support this , the best proof comes from Aristotle ( IV century BC ) , the greatest philosopher of ancient Greece , in his work " On the history of animals," he writes : " ... the biggest cows in Epirus , give each a container and a half from both breasts ... " and furthermore he adds " ... besides the donkeys, Epirus produces animals who grow thick and large all over and so do the dogs ... " . So the people of Epirus, historically held alongside other farm animals, dogs as working tools for keeping cattle and livestock out of various harms way. 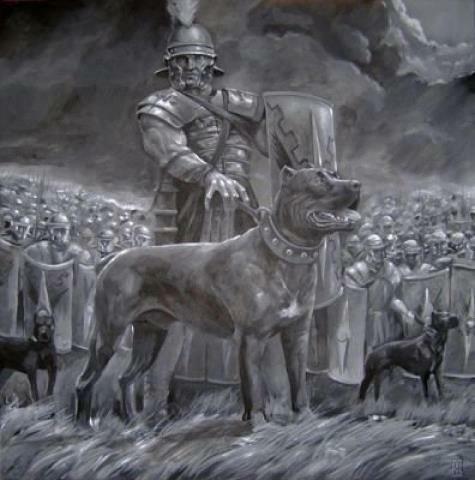 Some scholars contend that the Molossus was a dog used by the Ancient Illyria  also for fighting. They describe it as having a wide, short muzzle and a heavy dewlap (similar to modern Mastiff breeds) that was used to fight tigers, lions, elephants, and men in battle. 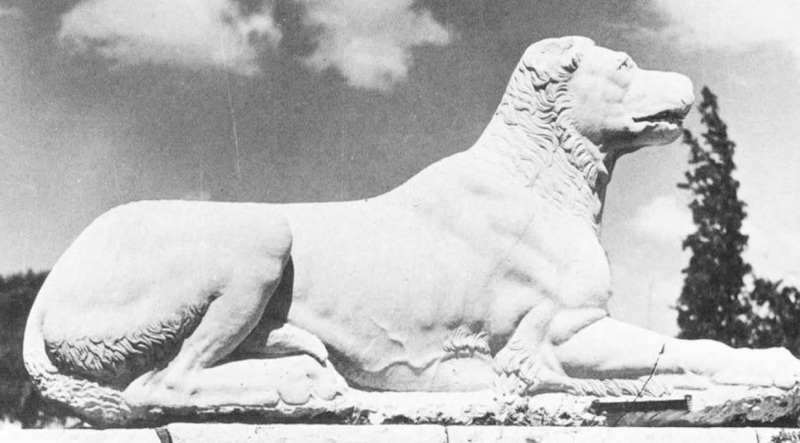 A Roman copy of a Greek original sculpture of a guard dog (known as the Jennings Dog) is generally considered to represent a Molossus and can be seen at the British Museum. Others argue that it was primarily a lightweight dog used for hunting and herding with physical characteristics more akin to Greyhounds or possibly the American Pit Bull Terrier. The first thing to notice on an Molossian is the large head. It is approximately 40% of body height. The height of the dog is about 60-65 cm (2 feet - 2.2 feet), while the length of 110-120 cm (3 3/4 feet - 4 feet). Chest circumference ranges from 85 cm to 95 cm, and width at shoulder 30-35 cm. Body weight around 40-50 kg (99.2 lb - 110 lbs), but even more. So it turns out that he has a massive and powerful body, associated with a large head - Well, this is precisely the characteristic feature of this breed dog. As regards the form of the skull of the head of dogs, there are three basic forms: dolikocefale (eg Saluki breed originating from the Middle East), mezocefale (eg hunting breed originating Pointer English) and brakicefale (p .sh. Boxeri German). Form the head being average mezocefale Mollos is neither long nor narrow, nor short or wide, but powerful. Ballin has wide and slightly round. But in terms of the type of head, it is lupoido - mollosoide. We note that the term "mollosoid" is borrowed from the name exactly such dogs who wore Mollosëve Illyrian tribes in antiquity and used today Cynology science, to show dogs with big body and very strong. The breed was native to Greece and the rest of the Balkans. It was later spread to Italy and other places in the Greek World by colonizing Hellenic peoples. Virgil says that in ancient Greece the heavier Molossian dogs were often used by the Greeks and Romans for hunting (canis venaticus) and to watch over the house and livestock (canis pastoralis). "Never, with them on guard," says Virgil, "need you fear for your stalls a midnight thief, or onslaught of wolves, or Iberian brigands at your back." Aristotle mentions them in the history of animals and praises their bravery and physical superiority. The breed's name was used to name the small furry bat Molossus and, in turn, the family Molossidae. Dogue De Bordeaux: A Comprehensive Owner's Guide by Joseph Janish, ISBN 1-59378-215-2, 2003, Page 10,"... THE DOGUE DE BORDEAUX The Dogue de Bordeaux falls into a group of dogs classified as molossers, descendants of the Molossus, a dog that lived around the time of 700 BC. Based on ancient carvings and paintings, it appears that Molossus, ..."
The Mini-Atlas of Dog Breeds by Andrew De Prisco, ISBN 0-86622-091-7, 1990, page 149,"... and Mastiffs were crossbred with the indigenous dogs, which were probably descendants of the ancient Molossus. The dogs were bred to fight to the death in the silent, stoic, ..."
The Mammals of the Southern African Sub-region by J. D. Skinner, ISBN 0-521-84418-5, 2006, page 277, "... XXII. F<u11ily MOLOSSIDAE Gervais, 1856 Free-tailed bats The name of the family is derived from the Greek molossus, a kind of dog used by Greek shepherds in ancient times. The head of a molossid is reminiscent of a ..."
A Complete History of Fighting Dogs by Mike Homan, ISBN 1-58245-128-1, 2000, Page 1,"... able dogs in battle previously known to the Romans were the Molossian dogs of Epirus, which, in their native country, Albania, were specifically trained for battle by the military. ..."
The Mini-Atlas of Dog Breeds by Andrew De Prisco, ISBN 0-86622-091-7, 1990, page 136,"... Mastiff prototypes , such as the Molossus of Epirus and Babylonian Mastiff, were used as flock guards against wolves and other predators. ..."
New Saint Bernard by George Gwilliam, ISBN 1-58245-168-0, 2000, page 8,"... now but it was part of the accepted culture at that time. When the Romans conquered Britain, they brought giant Molossus with them. ..."
http://classics.mit.edu/Aristotle/history_anim.9.ix.html , The History of Animals, "Of the Molossian breed of dogs, such as are employed in the chase are pretty much the same as those elsewhere; but sheep-dogs of this breed are superior to the others in size, and in the courage with which they face the attacks of wild animals." The Mammals of the Southern African Sub-region by J. D. Skinner, ISBN 0-521-84418-5, 2006, p. 277, "The name of the [free-tailed bats] family is derived from the Greek molossus, a kind of dog used by Greek shepherds in ancient times."